That would be great, @MurlinatoR. If you have an "in" with your service manager, see if he can hook up with an engineer. I was a service manager for about 10 years and I always had an open line to top tech people. 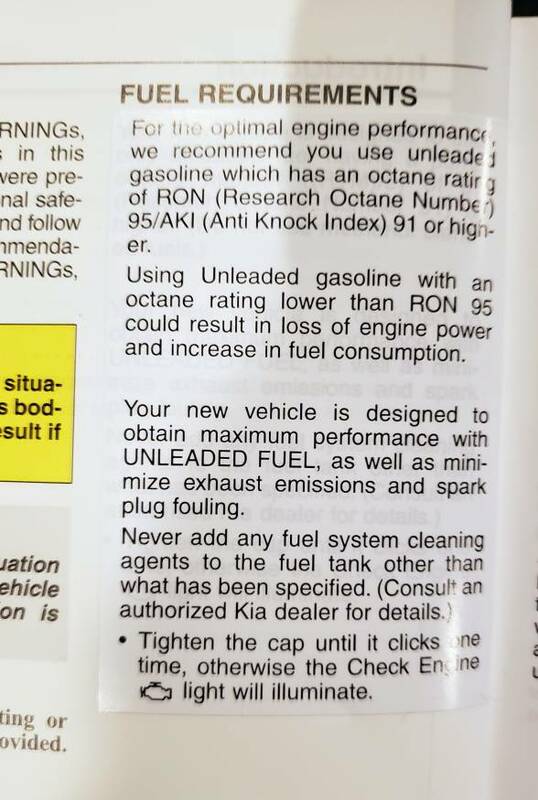 Just checked my manual and it still shows the original 87 octane even though I purchased my Stinger a few weeks ago. The language used in the new sticker is unfortunately no clearer than the old language. Any car should use higher octane fuel "for optimum performance." There is only one fact that matters: what is the Stinger's HP and torque output at 87 octane versus 91 (and maybe 93 as well for those interested). KIA knows the answer to this; they have known it all along, yet are not publishing it and instead issue vague and generic statements and recommendations that could apply to any car. FWIW, I've tested the car one week using 87, the next 93, then back to 87, back to 93 for about 4 weeks now, making sure to get 4he car as close to empty as possible each time. I haven't noticed any difference in power between the two, although most of my driving is to city driving mot much opportunity to really push sport mode. What I did find interestingly is that I get around 1.5mpg better per tank using the 87 octane than I do using the 93. In both cases, this is mostly city driving. Is there a limit to what octane rating is safe, can a car like the Stinger handle a tank full of 100 octane, or higher? You can go over 100octane if you want to, but it'll be a waste of money.